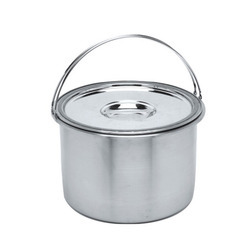 Steel Food Canister offered comes developed using superior grade stainless steel and features rich shine as well as have durable construction values. Coming with suitable handle support, these canisters are perfect for keeping of cooked food items. Some of its features include beautiful finish work, suitable for use in offices and residences, fine detailing work and breath taking finish, available in variety of pattern and sizes, smooth surface and durability which make these highly demanded items. Looking for Steel Food Canister ?